Join Felix from Gurney's Seed and Nursery as he casts a close look at pawpaw flowers and discusses the plant's flowering habits. Hi folks, Felix here with Gurney's and it's middle to late spring right now where we are, and I wanted to show you some wonderful component to pawpaw. You can see here, there is a pawpaw flower and what I like about pawpaw is that it'll flower early and it will stagger its bloom season quite a bit. We have one right next to it that has finished flowering already two weeks ago, and it's setting fruit, you can see the little baby pawpaw developing here. We have a nice cluster of five fruit on this one, and here we have a flower and it's still open and getting pollinated next to it, and if you have a really hard frost and you burned some of that early flowers, you will get some secondary flowering that, where you can still get a crop even in those years where we get a late frost. 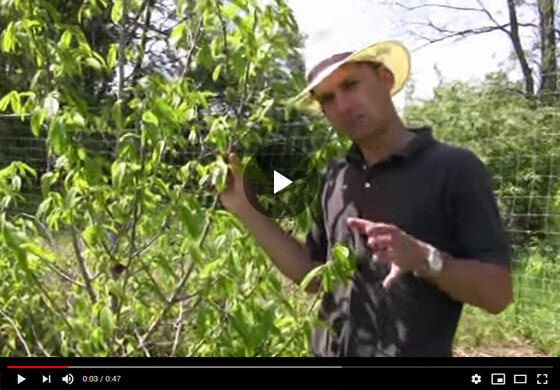 So a nice point about pawpaws, join us later for some of our other pawpaw videos showing how to care for your fruit.